If your Dad loves to cook (or even if he loves to eat) you’re lucky — because his Father’s Day gift can be all about pleasure and about living in the moment. Cooking, eating, reading about food, talking about food — these all can create unforgettable memories: the moment of the most delicious bite, the most exquisite meal, the sense of pride that comes from cooking something people rave about. These experiences stay with us to be savored for a long time afterward. Here’s our curated list of gifts your Dad will love, if he loves food — and really, who doesn’t? Let’s pretend for a moment you’re the scion of a royal family who happens to be isolated on a desert island along with a few guests of your choice, but unfortunately your chef couldn’t be there to feed you properly. Out of necessity, you would have to eat conservas, which would be dropped from a plane onto the beach daily along with a few bottles of champagne. The term “conservas” covers a broad range of preserved foods but in the world of foodies conservas means fine gourmet delicacies prepared in ways that bring out the best of the chosen ingredient. The price range is broad, ranging from Rabitos Royale by La Higuera (“splendid Mediterranean figs that are filled with a truffle and brandy crème, then covered in a delicate layer of dark chocolate”) for $1.25 to Jamon Iberico de Bellota by 5J Cinco Jotas 16 oz. at $199. Yes, there is a pocky made just for guys. It’s called “Men’s Pocky ” and it’s a very special pocky. The stick is slightly thicker than regular pocky and it’s dipped in a dark chocolate. I admit, I’ve eaten Men’s Pocky even though I’m a woman and it didn’t hurt me at all, just maybe made me a bit more aggressive than usual. It’s very popular and often out of stock, just like good guys are supposed to be. When you can find it, it runs in the price range of $3 a box, which is a fabulous deal. Some foodie Dads secretly love beef jerky but don’t want to admit it because some beef jerky products have a hint of backwoods lurking around them. But this delicious gourmet beef jerky from Candy and Cattle changes all that and Dad can continue to look as cool as ever while nom’ing down on artisan jerky in flavors making me hungry at this very moment: Apricot Corned Beef, Cranberry Pastrami, Honey Sriracha and Honey Teriyaki. Another interesting fact? They’re kosher. Find them here at $7.99 a pack. The world of foraging and preparing foraged foods is explored in this masterful book by Pascal Baudar. If your father likes being outdoors, hiking, foraging, or cooking, this tome is filled to the brim with knowledge and inspiration. Baudar covers smoked vinegars, beers, and so much more — this book is basically the new direction of wild foods and foraging. The photos are gorgeous and the writing is entertaining and worthwhile. Foraging has come a long way since Euell Gibbons was the “go-to” guy to learn the ways of wild foods. $28.76 to $40. This statement piece is for all the Dads who love bacon. This phone case features not just any bacon, but thick-cut bacon, in 3-D, three slices of it all lined up in a neat row. If clothes make the man, then so does the phone case. It’s a fact: If I happened to see a guy using this phone case, I’d immediately be checking him out, and I know I’m not alone in this. $34. Martha Stewart is basically a genius. You might love her, you might hate her, you might just be one of those people who love to say “She’s an ex-con!” before starting a discussion about deciding who and what she is, but one fact is inarguable: She’s been defining style and curating classic collections of everything that makes “home” a place where people want to spend quality time for a long time now, and she continues to push the envelope with collaborations from the TV show she does with Snoop Dogg to meal kits with Marley Spoon. Her latest venture is a wine company where she’s gathered her personal selections of wine at affordable prices to be ordered online. Thomas Joseph (who won a James Beard Award this year for his “Kitchen Conundrums” video webcast) who, as Culinary Director for Martha Stewart Living Omnimedia, worked closely with Martha on choosing the wines for this collection. He said that Martha tasted more than 500 bottles of wine before making the final selection — he knew this because he was right there beside her helping her with this arduous task. Well, back to Dad. If he likes good wine at a great price, this could be the perfect gift. Starting at $59.95 for the Discovery Half Case of award-winning wines from around the world. Why choose a meal at the classic NYC French restaurant La Grenouille for a Father’s Day gift over all the other great restaurants around the world? For one thing, it’s been open since 1962, and that’s a small miracle in the world of NYC restaurants. The classic French cuisine is perfection when it arrives at the table, and the atmosphere is unforgettable. The flowers at La Grenouille are famous in their astonishing (and beautiful) excess, and the service is impeccable. It’s possible to imagine you’ve been whisked back in time to the Mad Men era, particularly because the clientele (many of whom have been dining at the place for decades) are not looking at cell phones. They are dining, in the old-fashioned way, sans cellphone, just enjoying their meals and their company. This place is an extraordinary experience every lover of fine dining should have, if at all possible. Lunch and dinner a la carte or prix fixe lunch $64, prix fixe dinner $172, vegetarian menu a la carte available. A good knife is likely the most important tool in any kitchen — it can make or break both the cooking experience and the food. 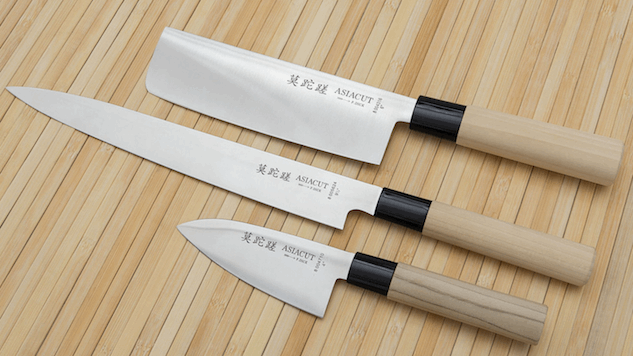 Like most kitchen tools, good knives are available at all prices from many well-known companies. But there are also custom knives available made by master craftsmen. The various designs make a statement about craft and about the hand-made experience that creating food can be. Here’s a great selection of custom kitchen knives any Dad who loves to cook would be thrilled to own. Prices run from $75 to $4,400. If you absolutely have to splurge, why not splurge on great caviar Petrossian has several “ultimate collections” to choose from, which include some of their “rarest, grandest, most superb caviars, available only in extremely limited quantities” along with delicacies like smoked salmon, duck breast, smoked scallops, caviar powder and more. Anyone partaking of this feast will probably start to believe they’re long-lost Russian royalty. These wonderful baskets will cost you about as much as a new car (from $7850 to $11,500, to be exact), but are much more delicious.